November 1, 2011 - Nate Schwartz founds Shape Shifters Fitness, LLC. February 1, 2012 - Grand opening of Shape Shifters Fitness 1st location in West Melbourne, FL! March 1, 2012 - Nate Schwartz becomes the official trainer of the local Clear Channel Communications talent. February 1, 2013 - 1st $500 90-Day Weight Loss Challenge begins! February 6, 2013 - 1 year anniversary ribbon cutting held at Shape Shifters Fitness by Melbourne Chamber of Commerce. May 4, 2013 - Katerina Russo wins the very 1st $500 90-Day Weight Loss Challenge at Shape Shifters Fitness. Katerina lost 30.2 lbs (12.37% of her body weight) in 90 days! Congratulations to her and all the participants! May 18, 2013 - 2nd $500 90-Day Weight Loss Challenge begins! August 11, 2013 - Katie Beauseigneur wins the 2nd $500 90-Day Weight Loss Challenge at Shape Shifters Fitness. Katie lost 30.4 lbs (13.22% of her body weight) in 90 days! August 26, 2013 - The 3rd and final $500 90-Day Weight Loss Challenge of 2013 begins! November 19, 2013 - Micah Custer wins the 3rd and final $500 90-Day Weight Loss Challenge at Shape Shifters Fitness! April 1, 2014 - It's the first ever....KISS 95.1 Weight Loss Challenge! Powered by Shape Shifters Fitness and Running Zone! We want to hear your story, why you want to train with us! KISS 95.1 will pick 4 contestants. Two will work out with Team Wingnut and two will work out with Team Kevin. ONE PERSON will win! Follow the challenge for the next 6 months by clicking the below link. August 21, 2014 - Nate Schwartz announces the very 1st $1500 90-Day Weight Loss Challenge at Shape Shifters Fitness. Never in the history has Shape Shifters Fitness has this amount of prize money been put up for grabs. Registration is from September 18 to September 21, 2014. New clients welcome! We are requiring 25 participants to launch the challenge. The challenge will end on December 19, 2014. Call Nate Schwartz at 321-474-0534 for more details. September 1, 2014 - Shape Shifters Fitness is a proud diamond sponsor for the 2014 Melbourne High School Band. 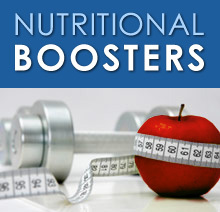 September 18, 2014 - Registration for the $1500 90-Day Weight Loss Challenge begin! September 21, 2014 - Shape Shifters Fitness is voted BEST PERSONAL TRAINING FACILITY in Florida Today's Best of Brevard 2014 voting ballot! October 11, 2014 - Team Wingnut member Andrea Leib from Cocoa, Florida wins the KISS 95.1 Weight Loss Challenge! Andrea lost 40.4 lbs. (15.65% of her starting bodyweight) and 10.75 inches off her total body! Great job! 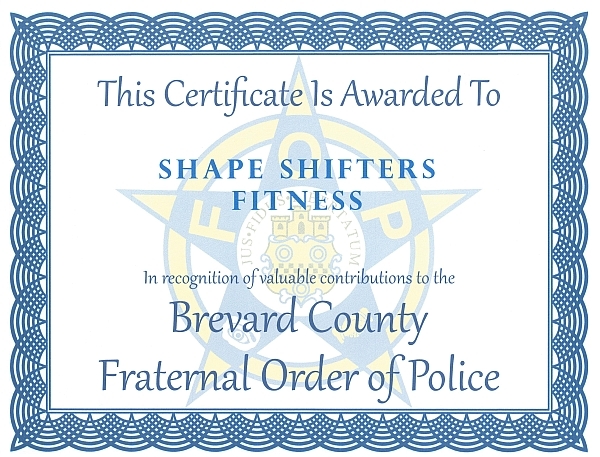 October 31, 2014 - Shape Shifters Fitness becomes a 2014 VIP sponsor for the Brevard Fraternal Order of Police fundraiser. December 20, 2014 - Karen Hunt wins the 1st $1500 90-Day Weight Loss Challenge! Karen lost 36.4 lbs. in 90 days! Excellent job! January 1, 2015 - $250 Monthly Transformation Challenge begins! Each month a new transformation challenge starts. February 5, 2015 - Cheryl Swaim wins the 1st month of the $250 Monthly Transformation Challenge. Cheryl lost 8.6 lbs. and 2.5 inches off her total body in the month of January! March 6, 2015 - Diana Douty wins the 2nd month of the $250 Monthly Transformation Challenge. Diana lost 4 lbs. and 2 inches off her total body. Her squat also went from 95 lbs. to 225 lbs. Great job! April 1st, 2015 - Tom Stratton wins the 3rd month of the $250 Monthly Transformation Challenge. Tom lost 5.4 lbs. and 3.5 inches off his total body in March! May 1st, 2015 - Willy Griffa wins the 4th month of the $250 Monthly Transformation Challenge. Willy lost 11 lbs. and 2.75 inches off his total body in April! June 2nd, 2015 - Willy Griffa wins the 5th month of the $250 Monthly Transformation Challenge. Willy lost 18.4 lbs. and 6.25 inches off his total body in May! Great job! 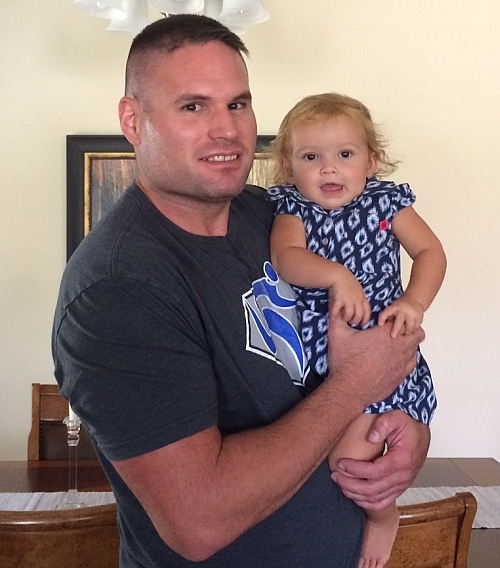 June 24, 2015 - My daughter, Tessa Schwartz turns 1 year old! Happy Birthday! July 2nd, 2015 - Cheryl Swaim wins the 6th month of the $250 Monthly Transformation Challenge. Cheryl lost 10.6 lbs. and 5.25 inches off her total body! November 3, 2015 - Laura Bellotte wins the $250 Monthly Transformation Challenge for November! Laura lost 11.8 lbs. and 3.25 inches off her total body! December 1, 2015 - Laura Bellotte wins the final $250 Monthly Transformation Challenge in December. Laura lost 7.6 lbs. and 8.5 inches off her total body! Great job! January 1st, 2016 - Happy New Year! This is Shape Shifters Fitness 5th year in business! February 26, 2016 - Shape Shifters Fitness once again sponsors The Brevard County Fraternal Order of Police. Blue Lives Matter! November 30, 2016 - Shape Shifters Fitness announces the end of the year buy 1 get 1 half off sale!